After the Kate Middleton and Prince William Easter scandal, the Royal Family needs some good press. Prince Harry’s trip to Nepal has provided Queen Elizabeth with some much needed distraction from speculation that the Cambridges’ marriage is over. Kensington Palace posted several photos on social media highlighting Harry’s trip throughout Nepal last week. Unfortunately, Harry’s relief work went virtually unnoticed, as the world turned its attention toward Prince William skipping out on Easter with the Duchess of Cambridge, Prince George, and Princess Charlotte. Harry took his official visit to Nepal very seriously. One stop during the trip was in Bhir Kuna where Harry exchanged a solemn Namaste greeting with one of the villagers. 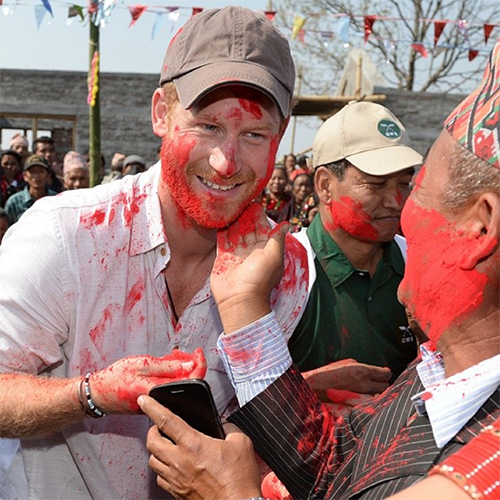 Prince Harry also participated in the ancient Hindu religious ceremony known as the Festival of Colors and worked with Team Rubicon on rebuilding a Leorani village school destroyed by an earthquake in 2015. A widow of a Gurkha soldier and her family welcomed Prince Harry into their Leorani home for an evening meal and an overnight stay. During his tour of Afghanistan, Harry fought alongside Gurkha soldiers. The Gurung family welcomed Prince Harry into their home for an evening meal and an overnight stay. All the while Prince William was trying to sneak off to Kenya for ex-girlfriend Jecca Craig’s wedding. Sister-in-law Kate Middleton, infuriated and humiliated, refused to attend Easter Sunday church services with the Royal Family. Instead, a sulking Kate slunk off to Carole Middleton’s home. Kate Middleton and Prince William are under pressure to step up their game while in India and Bhutan in April. Obviously, everyone is sick and tired of the Duke and Duchess of Cambridge using Prince George and Princess Charlotte a reason to pick and choose which Royal responsibilities they wish to fulfill. Kate Middleton And Queen Elizabeth Furious At Prince Harry’s Secret Palace Party: Demand Prince Give Up Bachelor’s Life?